Hanover, NH – Dartmouth Rugby (DRFC) captain Madison Hughes ’15 made his USA Men’s Eagles Sevens debut last Friday in Wellington on the New Zealand stop of the IRB HSBC Sevens World Series. During his off term, Hughes has been training at the Olympic Training Center in Chula Vista, CA. Hughes was named to the Eagles Sevens 12-man team after impressing for the USA Falcons (development squad) in the Men’s Elite Division at the Las Vegas 7s Invitational during the first weekend in February. 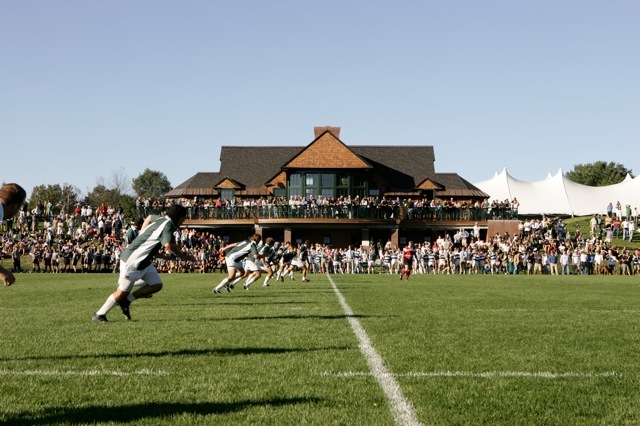 For many observers it was an inevitably, given Hughes’ work-ethic as he climbed the US player pipeline with successes for the High-School All-Americans, Junior All-Americans (becoming the highest points scorer in the iRB Junior World Trophy win), the Collegiate All-Americans, and a 2013 apprenticeship at the Olympic Training Center under the tutelage of then national team head coach, Alex Magleby ’00. Hughes came on as a substitute against Argentina and Canada in his first two matches and started the Eagles final match against Scotland. Hughes scored 33 points in the tournament including his first three international rugby tries, making him the fifth-highest scoring player in the tournament. Hughes became the fifth Dartmouth men’s player to pull on the Eagles jersey, following in the footsteps of Al Dekin ’87 (7s), Kevin Whitcher ’99 (7s), Alex Magleby ’00 (7s & 15s), and Joe Killefer ’06 (7s).